PROGRESSO, Argentina (AP) — Family, friends, supporters and former teammates paid tribute to striker Emiliano Sala in his small Argentine hometown on Saturday, almost four weeks after he died when the plane he was in crashed into the English Channel. 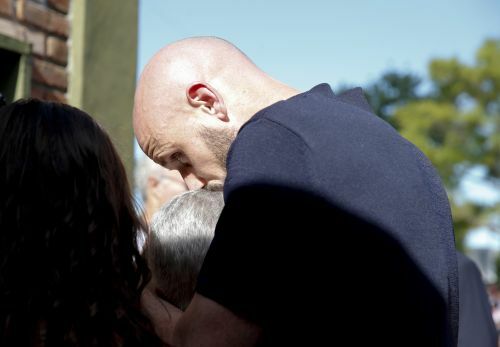 The 28-year-old Sala's body received a hero's welcome in Progreso where much of the grieving population paid their last respects to their soccer idol before the body was taken away for cremation. "It is something that I still cannot understand or accept because it hurts so much," said Progreso resident Lucia Torres, who was in tears. "My town shut down on Jan. 21 and remains shut down to this day." Sala was the best-known figure from Progreso, a town of several thousand inhabitants in Argentina's Santa Fe province, and was adored by many. He had been known since childhood here as "Emi." A post-mortem found that Sala died from injuries to his head and torso when his plane crashed in the channel. The single-engine aircraft was flying from the French city of Nantes to Cardiff where Sala was due to start a new career playing for the Welsh capital's Premier League club. Among those in attendance at Saturday's funeral were Cardiff City's manager Neil Warnock and his Nantes teammate Nicolas Pallois. Sala's body was recovered from the seabed wreckage last week but the plane's pilot is still missing. Authorities have said that the Air Accidents Investigation Branch investigation could take up to 12 months. A pre-inquest review hearing was set for Nov. 6. "He is my player, he's signed for me," Warnock said of Sala, adding that he'd met with striker's family. "And then you look around the whole village here. It's like the whole village is part of it; I've never known anything like it. People showed me pictures where he was 4 years of age and then 7 years and I spoke with his teacher." Sala's body was flown to Argentina and arrived in Buenos Aires on Friday before being driven to Progreso, where Sala grew up.